I've broken down the ingredients below! Let's create your perfect suite! 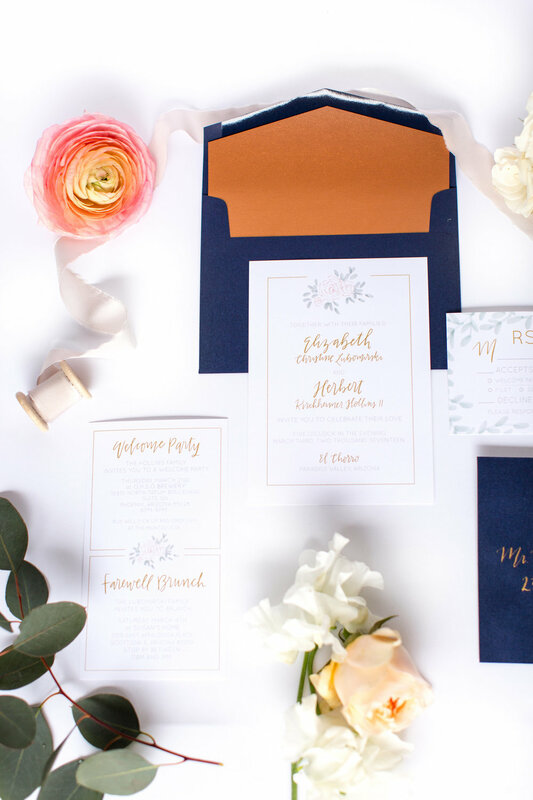 This is the main event; it communicates the couples' names, the wedding date, time and venue, along with information as to who is hosting the wedding, and sometimes, additional information regarding attire, reception, and more. This piece also dictates the rest of your design, so it's always our starting point! 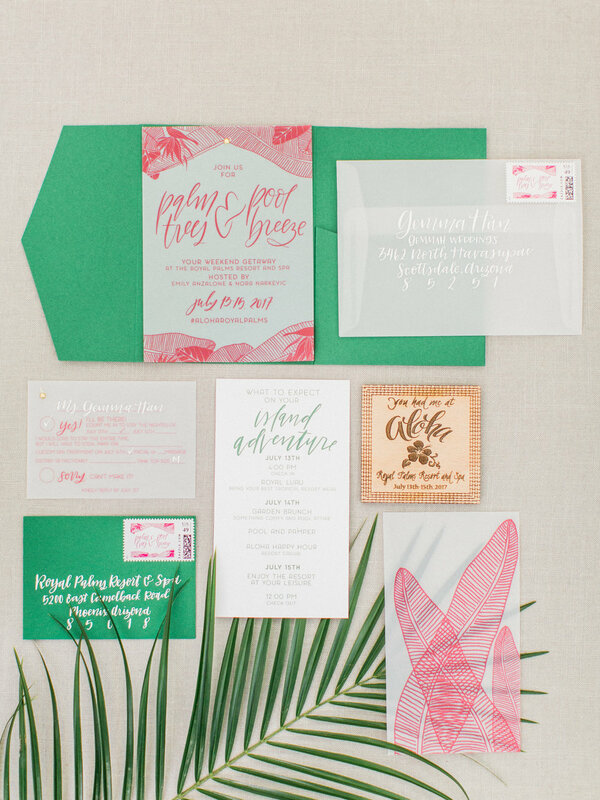 I love how envelopes can bring more color and texture to a suite. These can be printed with your guests' addresses, or addressed with pointed pen calligraphy. 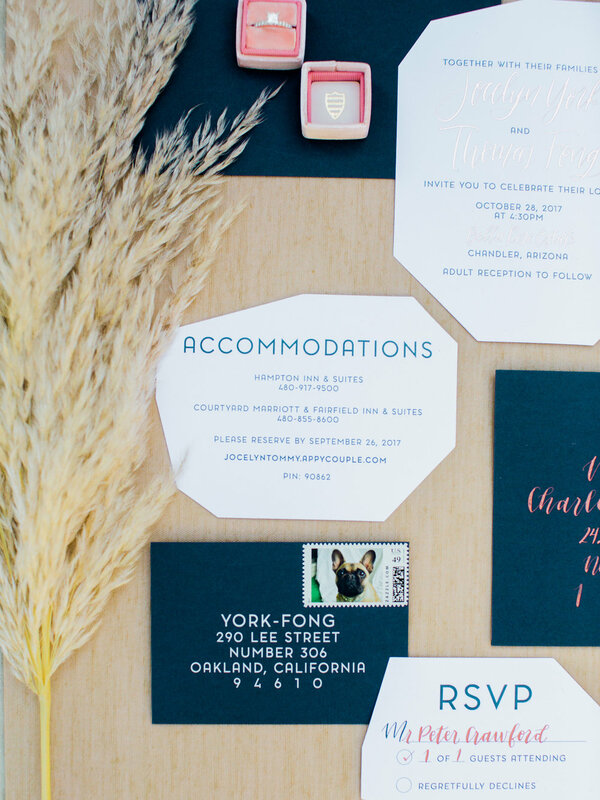 You'll likely need two envelopes for each suite— one for your RSVP card, and one that will hold all the pieces! Enclosures are the new "inner envelope," in my opinion. They contain all of your pieces, but are much more practical than the traditional inner envelope. These come in tons of different styles, and make for a very clean presentation. And to any opportunity to infuse more color and personality, I say "absolutely!" We use RSVP cards to capture guest information, dietary preferences and meal choices, and sometimes, even a song request or two! You can also use RSVP cards to help communicate how many people at each address are invited. In the digital age, RSVP cards are also sometimes used to point people to your online RSVP portal on your website. Liners are magical; they bring everything together and elevate your entire invitation suite. I like to use photographs from gorgeous engagement sessions, custom wedding crests, watercolor patterns, floral designs... the sky is the limit. Envelope liners will definitely take your design to the next level. 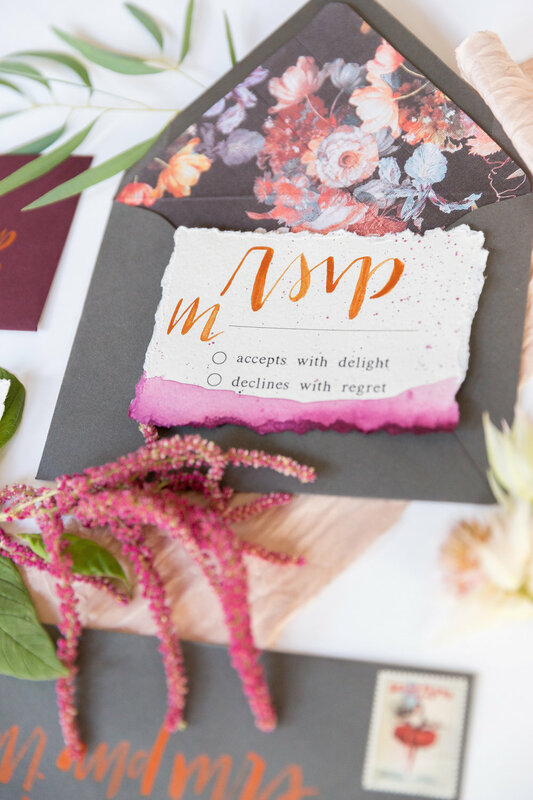 A suite is a compilation of all the pieces that make up your wedding invitations. Some suites are more basic, and other suites are more involved, with details inserts, liners, calligraphed envelopes, belly bands, wax seals, etc. The important thing to remember is that you will need one suite per party, not per guest. Traditionally, inserts held information regarding hotel accommodations, attire, and registry details. Now, so much of this is hosted on your wedding website that an insert pointing guests to your url often does the trick! You can also use inserts to invite guests to bonus events, like a welcome cocktail party, rehearsal dinner, farewell brunch, etc. Another often-forgotten piece of the puzzle is the act of actually putting it it all together. Assembly includes lining envelopes, stamping them, organizing pieces, stuffing and sealing them up for mailing, and hand-cancelling at the post office! This can be a time-sucker; consider adding assembly services to your proposal if your schedule doesn't allow for it! Postage not only plays a fun role in design, but also in your bottom line, so don't forget to budget for it! And, remember that you'll need postage for your RSVP envelopes so that your guests don't have to worry about it. Custom postage is another great opportunity to personalize, or you can find stamps on USPS.com! Order in advance! Some words to know that may help along the way! Flat (or digital) printing involves ink on paper; it's as simple as it sounds. The ink is not raised or impressed into the paper, but printed directly onto it. 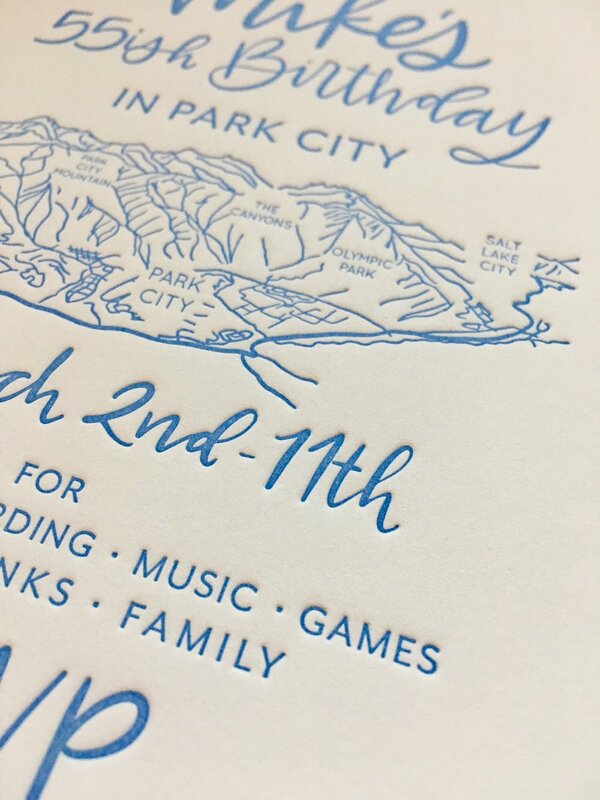 For best results, I recommend flat printing darker ink colors on lighter stocks! This is the most affordable printing method, and it may be combined with other printing methods. Fonts are set of characters of the same style and size. These are typically computer-generated, and are not done by hand. Most stationery includes a combination of fonts and hand-lettering styles, and knowing the difference can help with the proofing process! Foil stamping is metallic foil applied to paper with a heated die stamp. A custom plate with the design is created and coated with the metallic foil, then it is pressed into the stock. The result is suuuuper-luxurious. Foils come in a lot of different colors, and can also be customized. Unlike fonts, hand-lettering and calligraphy are done by hand, then made digital so that the design can be printed. Some suites are entirely hand-lettered, but most of the time, only certain portions (like your names and venue) are done this way, so that the hand-lettering really stands out. Letterpress printing requires a printing press. A custom die is created and inked, and pressed into a thick, heavy-weight stock. This process causes a relief effect, creating an amazing texture and luxe feel. Because the process is intensive, requiring mixed inks and custom plates, it is much pricier than other printing methods. This is a digital mockup of your stationery that allows you to review wording, colors, design, etc. I send these large files via DropBox, so you can share with all the cooks in the kitchen (...or not!). Proofs are provided for printed items, and are approved before the file is put into production.